The 2010 Off Road Expo is returning to Westfield Parkway in El Cajon. If you're not in the desert, then make sure to get down there and see all the Off Road Vehicles including Jeeps, ATVs, Trucks, Dirtbikes, Buggies and more. Event partners: Motoworld of El Cajon and M.I.T. Drivetrain Specialists. Dune season is upon us and as a responsible duner, I urge you to stop and take a minute to not only think about safty, but help spread the message to other duners. The Checkered Flag program helps endorse the responsiblity of respecting others and the environment. Make sure you fly your checkered flag proudly and show all the other duners that you dune with respect for others, for safty, and for the environment. Have a safe and fun-filled 2010-2011 season, and don't forget to help promote responsible duning. 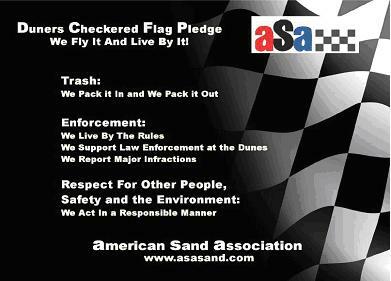 The American Sand Association is offering a free checkered flag and pledge card with purchase online. Hey Duners, the US Border Patrol is asking for your help in the reporting of illegal activities. You are urged to help by reporting any and all suspicious activities. USBP Agents provide continuous patrol and may be contacted in person or by phone (866-999-8727) 24 hours a day, 7 days a week. You can also help protect the border by maintaining a minimum distance of 100 yards from the International Boundary Fence. Not only is it a safety hazard to ride near the International Border Fence, but staying clear of the fence helps the US Border Patrol to spot criminal activities. Please stay back. A white USBP trailer will be parked near the Bureau of Land Management Ranger Station in the Buttercup campground and is a great place to report suspicious activities or simply just ask some questions. Please enjoy your 2010-2011 dune season and if you happen to spot any suspicious activities, stop and find a US Border Patrol Agent and report them at once. Friday, November 12th and Saturday, November 13th from 9:00am to 5:00pm adjacent to the Glamis Beach Store and Glamis Fab, King Shocks will be performing a tuning session for sand cars only. The tuning session will run $150 plus any additional parts needed. King experts will not be working on any cars so it's up to you to remove your own shocks at your campsite and bring only the shocks back over to the King trailer. If you don't wish to remove your shocks yourself, then Glamis Fab will remove and replace your shocks during your session for $50.00 per corner. Call King Shocks at 714-530-8701 to schedule the time and date of your session. For more information about the King Shocks Dune Tune 2010, please visit the King Shocks website. For all of the dedicated SandRazor fans out there, I know it's been a long time since you've seen any major changes to the website and some of you might have even wondered if the site was even still being maintained. Basically, five years ago, I cracked the frame on the sandrail and honestly, it just hasn't been a priority to spend money replacing it. One of these days I'll hopefully get around to giving it some well deserved attention. Anyhow, I assure you, while SandRazor.com might have seemed abandoned, it wasn't and it's not. I've been spending a lot of time lately, working on the next version of the site. The obvious change, which I'm sure you've noticed, is the new brown colors that have replaced the old blue ones. I've also removed the forum as it was no longer being used for any valid reasons and the only new posts seemed to be from friendly spammers promoting Viagra. Forget them! In place of the forum, I've added this blog which I will be using to keep everyone updated with the latest desert news. I also completely restructured the photo gallery. Check it out, you might even find a few photos that have never been featured on SandRazor before. Also, if you haven't already, make sure to check out the video section. I haven't added any new ones lately but they're the only known videos on the Internet that contain vintage water-pumper buggies from the 1960's. If you happen to know of any other site with vintage sand buggy information, let me know. In fact, use the new contact page to drop me a note. I'd also love to hear what you think of the new website. Please enjoy the refreshed version of SandRazor.com and bare with me as I continue to improve the site.